Here's a color wood block print made by Gustave Baumann in 1924. I don't really like it all that much. 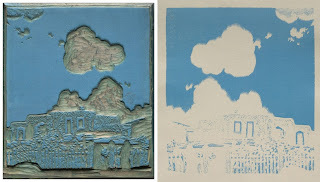 So why is it today's featured block print? Because the Cleveland Museum of Art has made available on-line an incredible collection of images that show Baumann's entire process of making this piece. Summer Clouds was made using six blocks for the six colors, and you can view each of the carved blocks, as well as the printed proof from each block. This allows you to get a little bit inside Baumann's head and see how he broke down the scene in his mind. He had to be able to figure out not only which areas he wanted to be each of his ink colors plus white, but also to envision what would happen as the various colors overlapped each other. 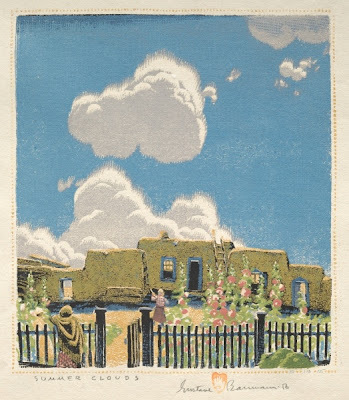 For example, the color of the pueblo comes from ochre ink on top of black ink, a combination I wouldn't have expected. the entire block dedicated to a few pink flowers. I like the border of little yellow dots all around the edge! To see all these images every step of the way, go to the CMA web site and check it out. It's a fascinating glimpse behind the scenes - the magician showing us how the trick is done. But that doesn't destroy the wonder. Knowing what it takes to create this piece makes me appreciate it more.